← The Most Unfair Exchange Ever! Those who could see out of the plastic windows of the marquee were no longer listening to Stuart’s teaching – they were pointing to something going on outside. They got up to look closer and Stuart himself got down from the platform to see what it was all about! What we all saw was totally spectacular. A huge gap had opened up in the clouds and the late afternoon sun had come streaming through. 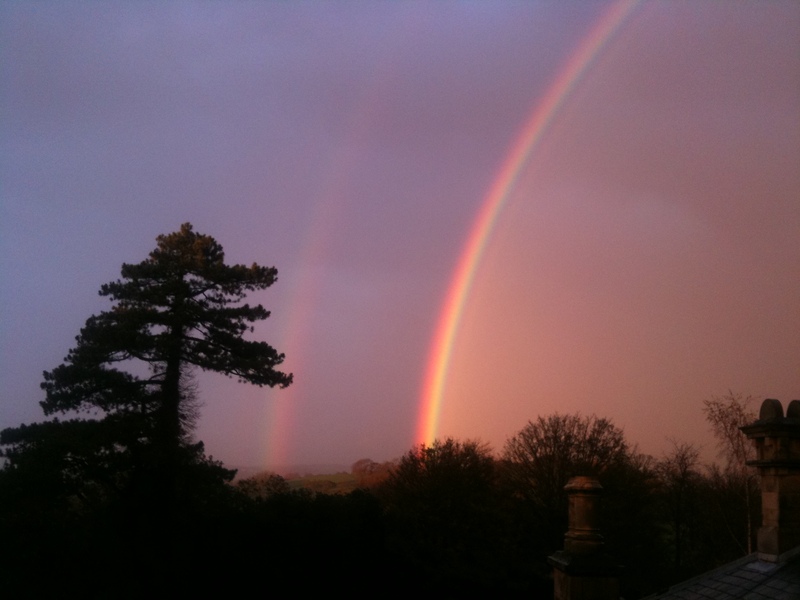 Right in front of our eyes, over Ellel Grange, was the most brilliant rainbow most of us had ever seen – it was a complete rainbow – a double rainbow – a sensationally bright rainbow. The complete arc was too wide for anyone to get into one picture on their camera. It was totally stunning. 18 Responses to The God Who Speaks! I love the knowing and the trusting, and still there is awe created in us every time our Lord affirms his lovingkindness. I see Him smiling at His wide-eyed wonder-full children as we abide in our response to His lovingkindness. Surely He seeks our faces as we seek His. Thank you for the vision. Congratulations on 25 years! What a glorious rainbow! What a dialogue that took place between Heaven and earth through this encounter. The earth was declaring God’s goodness when Heaven replied with God’s affirmation of His ever lasting faithfulness to care for man kind. May His name be praised and glorified forever and ever until the day He comes back to take those who are waiting His return. How beautiful! I am reminded of the colorful solar halo that appeared over Ellel USA this past June. I look forward to seeing what God will do! We are blessed with seeing rainbows very often, but the revelation that I have got is very special. We forgot that as we see the rain bow, we see the promise of God that He will be with us all the time to the end of times. I am from Malawi C. Africa, I am blessed with the ministry of Peter. Is it possible to get the full teachings that was taught during the anniversary by Peter and McAlpine? Hi there. I’m rejoicing with you for this ministry having been personally blessed when teams have come to Australia. What a wondeful reminder of His faithfulness. Congratulatons. We serve a Wonderful God. I thank God for giving lovely Ministries across the globe. May God lift Ellel Ministries and Team to a Higher Level. God Bless. Thank you, Peter, for putting this great moment so quickly down in your blog. It was a real blessing that I could share this wonderful weekend – thank you and the team for all! Hallelujah! Your post today was an answer for me. On the weekend I was in Ellel Budapest at the Modular School B. In the first time I had questions, if it’s all right, what there is or not. In my church I never learned this things. Yesterday I had from my sister a question: is it really biblical? I think, yes. Of course, nobody knows all perfect. But, in Ellel are people from God, there gave her own spirit, here own heart for God. And our Abba ” search the heart and examine the mind” (Jeremiah 17:10). So we all can know Him and Her truth in our heart/spirit. The story of the rainbow is inspirational. We saw a breathtaking double rainbow in North London on October 26th. One friend was in Stratford, and saw it appear over the Olympic site. But to have experienced such a sight during the 25th anniversary at Ellel Grange when 25 years ago, the same thing happened, is awesome. I hope to be able to visit Ellel Grange personally soon. Sorry, I understand now that the rainbow appeared at the same time as Ellel Grange was opened 25 years ago- not that there was another rainbow then. if there had been, it would have been a phenomenal coincidence! I have been greatly blessed to have been at Ellel Grange a little piece of heaven on earth and it was wonderful how our loving heavenly Father,Maker of all things and Judge of all men placed. a lovely rainbow over the place exactly 25 years to when it was bought on halloween to save ,heal and deliver His precious children from all over the world from the kingdom of darkness into the Kingdom of God though Jesus . Hallelujah.JESUS IS THE LIGHT OF THE WORLD:). I had the great privilege of being there for most of that celebration weekend! What an awesome God we serve! I wasn’t there on the monday to see the rainbow but what a wonderful confirmation from God … He truly knows what we need and His timing is absolutely PERFECT!!! Everything about that weekend touched my heart as well as the two friends who were with me. We couldn’t help but keep remarking about how BEAUTIFUL it was to see just a glimpse of God’s kingdom before our very eyes here on earth … the sense of family that just oozed out of every single part ~ God’s family … and the unity that was displayed and felt through every fibre of all that took place! I just want to take this opportunity to say a personal thank you once again for the obedience to God’s call on your life … my life would not be what it is now, if at all, if God had not lead me to the doors of Ellel Grange 12 years ago! I am SO looking forward to seeing & hearing, even being a part of what God will do in the days, weeks, months & years to come!!! May God continue to bless you and keep you as you endeavour to seek His face and walk in the way He has planned for you and those who are involved in the work of Ellel … “an oasis in the desert!” To God be ALL the glory! Amen. How wonderful is our God. I am so encouraged by your Blog. I don’t know if you will remember me you Knew me as Kim Bramley. I am so greatful for the work of ell ell yoGod has used you in my life and I have so muchmore emotional freedom and am more whole than I ever thought I would be twenty six years ago. God bless you and all you do. Kim.